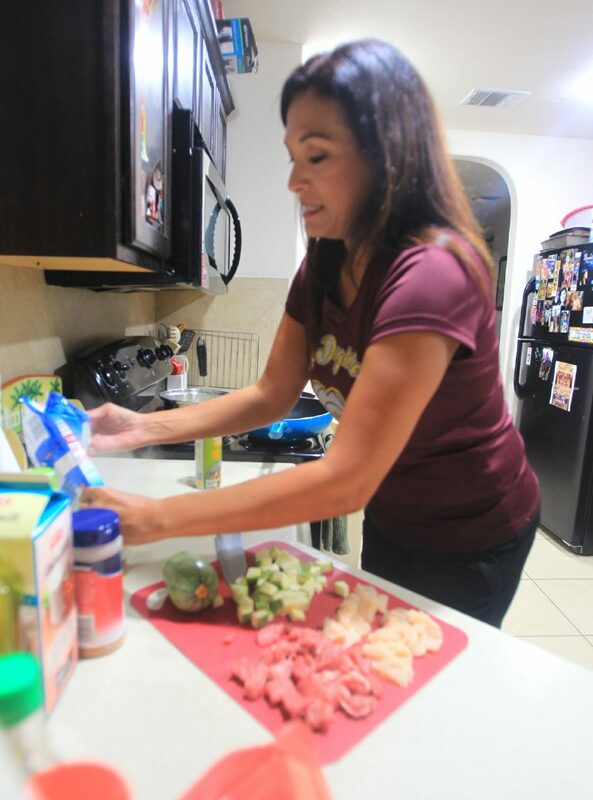 Monica Galvan prepares healthy ready-to-eat meals for her daughter at her home Thursday, August 2, 2018, in San Juan. DONNA — When Miranda Sandoval approached her mom Monica Galvan about healthy eating, she knew her commitment level in athletics had reached another level. Already a talented volleyball player and basketball player — even though she’s maybe 5-foot-6, you don’t want to battle with her under the basket for a rebound — for the Donna High School Bravettes, she clearly wanted to take it up a notch when it came to personal fitness as well as athleticism. Years ago, it was just known as making lunch for the kids. That isn’t the case anymore. Food prepping has not only been associated with a healthier lifestyle, but it also saves time (maybe not money, because as Monica said “eating healthy isn’t cheap”) for those involved. Most people, like Monica, will prep enough meals for multiple days. She had been food prepping for years — for herself and her son Jonathan — so adding Monica wouldn’t be too hard … except when it came time to finding vegetables to help complete a well-balanced meal. Not too long ago, athletes went to the extent of maybe eating a protein bar or whipping up a protein shake. Now, as competition gets tougher and bigger, faster, stronger is the theme of the era, everything that an athlete eats has a consequence, good or bad. “Meal prepping is very controlled and I try to cook as healthy as possible with 6 ounces of lean protein cooked in coconut or olive oil, green veggies and a carbohydrate like rice or a potato — she doesn’t like sweet potatoes (the better option when it comes to potatoes) so we have to find other options,” Galvan said. They don’t use the word “diet” in their house, replacing it with “healthy choices,” Monica added. Diets are, for the most part, used in a short time frame but healthy choices are a lifespan. She added that the family has a history of anemia and eating healthy is critical to keeping that under wraps. “Food is where we get our nutrients from so it’s crucial to be healthy,” she said. Miranda, a senior, has an active schedule, not just practicing and playing sports but also trying to put in as many hours as possible at work. Of course, when life is busy it seems that fast food joints are stacked rows deep on every corner; chips and candies and cookies are all within reach on the shelves or in the cupboard. At that precise moment, it doesn’t seem like that “one” decision isn’t anything bad, but snow is only a flake until it snowballs out of control. Monica uses the out of sight, out of mind rule. Galvan said one of Miranda’s favorite meals is cube steak with Miracle noodles, which have no calories or carbs but take care of a person’s “pasta fix” and deliciously soak up the flavor of whatever juices and liquids they are cooked in. For mom, the favorite prepped meal is Asian lettuce wraps. Monica says she can’t really find something she doesn’t like. That’s not the same for Miranda, whose vegetables are limited to cauliflower, broccoli and zucchini. Asparagus or salads are just not on her menu. And while a balanced meal and good portions are critical — so is having fun … like cheat day. And when cheat day comes around, there’s little question what’s going to be on the menu — there won’t be any greens … unless it’s a chili poblano or maybe some jalapeños.